In Outlook on a PC, choose File. If your ribbon doesn't have a File option in the top left corner, you're not using Outlook on a PC. See What version of Outlook do I have? to get to the export instructions for your version of Outlook. At the bottom of the page, select to go to the People page. 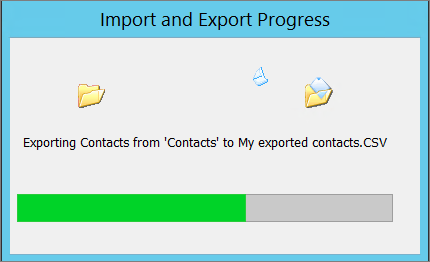 On the toolbar, select Manage > Export contacts. At the bottom of the page, select to go the People page. At the top of your Outlook 2010 ribbon, choose the File tab. If your ribbon doesn't have a File option in the top left corner, you're not using Outlook 2010. See What version of Outlook do I have? to get to the import instructions for your version of Outlook. Under Create a file of type, choose the type of export that you want. The most common is Comma Separated Values (Windows), also known as a .csv file. Then click Next. If you are exporting contacts for use in another copy of Outlook, choose an Outlook Data File (.pst). Under Select folder to export from, you may need to scroll up, and then select the contact folder that you want to export. Choose Next when you're done. Note: Unless you chose to export to an Outlook Data File (.pst), you can only export one folder at a time. 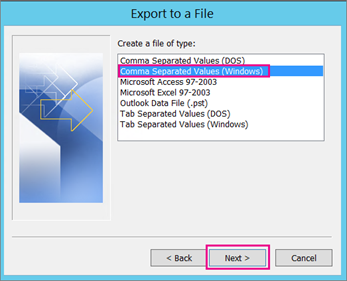 Under Save exported file as, click Browse, select a destination folder, and in the File name box, type a name for the file. In the Export to a File dialog box, click Next. 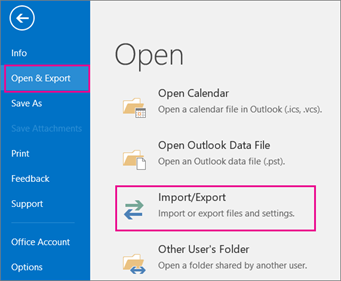 When the export is finished, choose OK to exit the Outlook Options box. Go to the location on your computer where you saved your contacts, for example, in the Documents folder. If you exported your contacts as a .csv file, you can use Excel to see what was exported from Outlook. You'll likely have a lot of empty cells. That's normal. 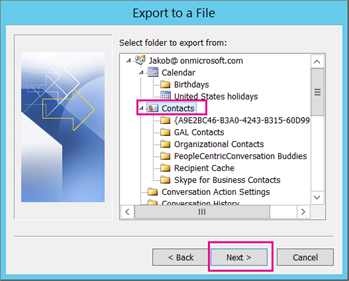 To import your contacts into Outlook 2016, see Import contacts to Outlook.